Since having children, I’ve discovered, I much prefer to shop for them over myself. Who agrees? It doesn’t matter if I’m on the hunt for boy clothes, toys, or décor for their playroom and bedrooms, it’s so fun to shop for kids and hard to resist wanting to buy it all. After having my two boys I did not return to work fulltime so I’ve had to be an efficient shopper now more than ever, only buying what I think the boys actually need and staying on budget. I’ve been lucky enough to receive lots of hand-me-downs from family and friends the last few years which has been a major help and also makes me feel a little less guilty when I do splurge on a purchase for them. I have received many sweet compliments and questions on where I shop for the boys so I’m laying it all out for you when it comes to apparel, room décor, and toys. I pretty much dress my boys the way I’d dress my husband if he let me. 😉 Here, is what I think, are the best places to shop for apparel for the kiddies. 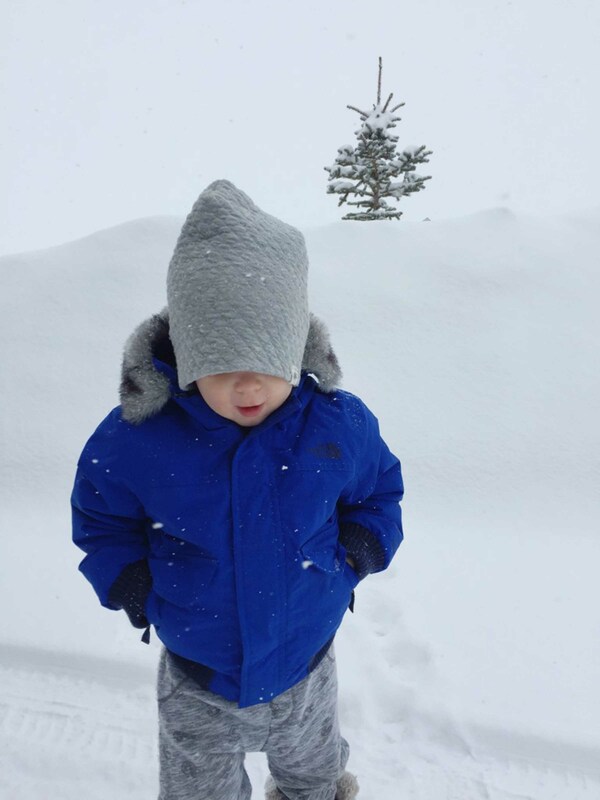 Luke wearing pants from Preshrunk and North Face jacket from Sporting Life. Gap – Gap is your classic go-to. You can get all your staples there such as jeans, vests, jackets, button down shirts, tees, jammies, socks, and underwear. They also have special clothing lines with partners like Disney which is fun for dressing your kids in theme for a party or a trip! I never spend full price at Gap because there is always a 40-50% off promo. If you sign up for their newsletters you can stay notified when these sales are taking place. And, if I’m really in a pinch for tops or jeans I just end up going to Gap Factory because they carry great basics too. Their prices are even better because they have 40% off the entire store all the time. 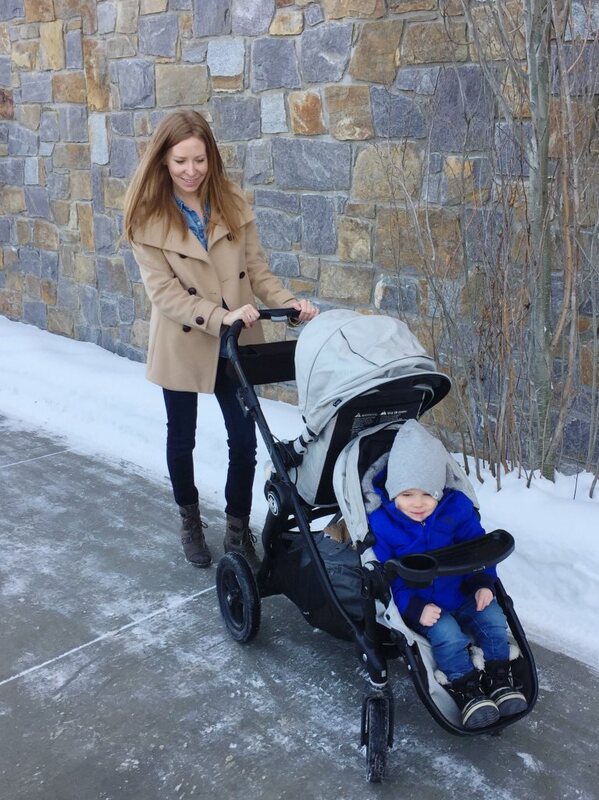 H&M – I have been shopping at H&M since Luke was a baby and it has never steered me wrong. Lots of neutral tones and very trendy!! I find they don’have as many big sales but they have the occasional ‘buy one, get the second 50%” and they have a good back to school sale. Joe Fresh – I always shop at Superstore for groceries so I can’t help but hit the Joe Fresh kids section. Their selection can be hit or miss sometimes and the clothes might only make it a season but I usually grab the boys extra sweat pants, jammies, sun hats, and socks for under $10. Old Navy – When I need some fresh new tops for the kids I always turn to Old Navy. They’re great for your staple pieces just like Gap but cheaper in price. My go-to tops for the boys are their raglan baseball tees, waffle shirts, henley tees, and v-neck t-shirts. Their shoe collection is also stylish and very affordable. Old Navy always has 40-50% off too so there is no reason you should ever have to pay full price! Preshrunk – I first discovered Preshrunk on Instagram and I’m so grateful I found them! It’s the perfect place to online shop if you care about responsible consumerism. Preshrunk carries upscale consignment clothing in new or “like new” condition from some of my favourite brands like Janie & Jack, Crewcuts, Nordstrom Baby, The North Face, Patagonia, TOMS, Jacadi, and Tucker & Tate to name a few. It can be hard to justify those brands at full retail price when your child is in and out of sizes quickly so Preshrunk is the answer if you care about style, budget, and our environment. I love that they’re local – you can pop into their warehouse on Saturday’s on Manchester Rd. or shop online. Roots – Roots is great for the classic sweat pants and hoody combo, rompers, tees, and plaid shirts. Their pieces can be expensive so I only get them when they’re on sale, anywhere between 25-40% off. Roots is always having sales but you just have to be patient and hold out for a good one, and sign up for their emails because there are major savings to be had. Sporting Life – I’ve been shopping at Sporting Life since I was a child. I love love love LOVE this store. The quality of products they carry are top notch, it’s a fun place to shop, and they even carry Canadian brands like Local Laundry and Tuck Shop Trading Co. I usually grab the boys’ winter attire from here but I always make sure to get it on sale. I sign up for their newsletter and watch for their deals and promotions like a hawk. They also have really great clearance racks where I snag lots of Polo and Ralph Lauren items for under $20. Zara – Zara is my latest obsession for kids. I wouldn’t say they have an overly huge selection but their clothes are SUPER stylish, affordable, and the quality is there. If something isn’t in stock in-store you can order it through them and have it shipped to the store for free or pay $5 for it to ship directly to your house. The best part is they send you text messages with shipping updates so you know the ETA on your package. Zara Kids is a great store when it comes time for those picture perfect family photos because they have a great colour palette to work with if you want to look similar without matching. Custom sign in Luke’s bedroom by 47th & Birch. 47th & Birch – My sister-in-law has a business, 47th & Birch, specializing in one of a kind pieces for your home. She makes custom signs and pillows, refurbishes furniture, and creates other accessories for the home that are unique and personal to the family. Lisa takes custom orders so if you have an idea or theme you want to stick with for your child’s room, contact her and she will make your vision come to life! She made this awesome sign that I wanted for Luke’s car theme room and it really tied everything together. Check her out and follow her on Facebook & Instagram. Ikea – We have touches of Ikea in our home in just about every room. Ikea is the perfect solution when you’re not sure what to do in a space and it needs a makeover without breaking the bank. They have so many ideas and lots to choose from even if you just go and shop their marketplace for accessories. I love looking at all the fun items like plants, shelves, frames, prints, mirrors, baskets, hooks, rugs, wrapping paper, and toys!!! Ikea is also the best for storage solutions for closets and playrooms. 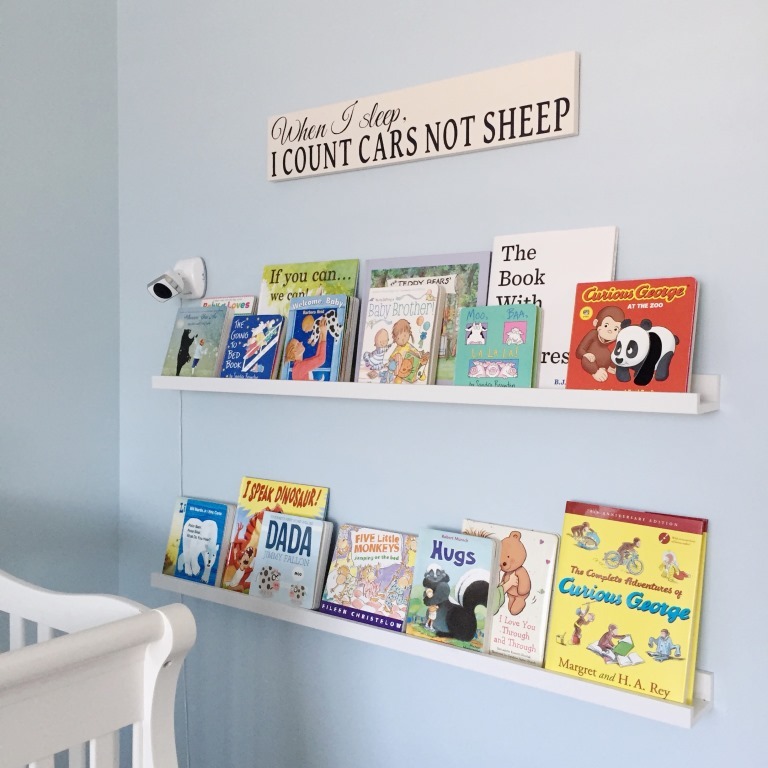 Charlie and Luke both have the Ikea Hemnes dresser and end table in their bedrooms, and their playroom has the Lekman Boxes and the Kallax Shelf for toys. Everything is so functional and affordable. And if these pieces get a little beat up it’s not a big deal. Pottery Barn Kids – You can never go wrong with PBK. It’s usually my first stop for a baby shower gift. Did you know our Chinook location has a monogramming service in-store? Customize your baby shower gift with that extra touch of having it monogrammed. I also love PBK’s seasonal décor and usually scoop up some fun accessories to jazz up the boys’ rooms or the playroom. My favourite “must-have” item for babies/toddlers is the Anywhere Chair. PBK has 25% off one item a couple times a month. They also run their buy more, save more event every few weeks. And they have bedding and furniture events at 30+% off. Restoration Hardware – It doesn’t get more dreamy than RH Baby & Child. All of us sleep in RH bedding because it’s truly the best and washes so well! Truth – the fabric actually gets softer the more you wash it. Their furniture is to die for but it’s the shipping and taxes that get us every time so instead I just shop the bedding and children’s accessories. I usually wait until they have a sale and then swoop in on their bedding packages. If you don’t want to spend a lot on toys than Walmart and Toys ‘R Us are great places to shop, but if you’re looking for classic or unique toys than I suggest checking out the following stores. Browsing the children’s book section at Indigo. HomeSense / Marshalls – The great thing about HomeSense and Marshalls is that you never know what you’re going to find when you walk through those doors. The downfall is…you never know what you’re going to find. I either walk out with a bag full of goodies or nothing at all because it can be hit or miss. I not only shop here for the boys on the regular but it’s also one of my stops for baby gifts and birthdays too! They have really stepped up their game in the toy department. I’ve seen them carry Green Toys, Hape, and Babbat at prices that seriously can’t be beat. I also love their book selection. You can find lots of great classics at half the price. Indigo – 3 words – free gift wrapping! Need I say more? I easily can wander the Indigo Kids section with Luke for hours 20 minutes but that’s pretty good for a toddler. 🙂 He usually ends up at their train table while I look around for gifts but it’s the perfect place to shop because everything is so organized. They also hold lots of great deals like free shipping every now and then and 20-30% off select toy brands in-store and online. They also do a few scratch and save events and earn 5x the Plum points. Mastermind Toys – Another great store with free gift wrapping! Wrapping gifts can be so time consuming especially at Christmas or during busy birthday months so it’s a no brainer for me to shop at Mastermind. Again, they carry some really great toys just like Indigo but they also offer unique brands like Plan Toys and Playmobil, etc. Every few months they have 20% off one item so I usually put it towards a big ticket item. Hope this list helps when you’re looking for places to shop for kids! Previous February: What’s in my cart?